One of the most interesting things about Google’s new social network, Google Plus, is the conversation that participation generates. Some still attribute this to the newness factor, but it’s one of the things that really makes Google Plus exciting right now. One of my first observations is about the kind of content that attracts the most interest. Simply republishing blog posts is not necessarily the best way to generate conversation. Publishing a somewhat divisive opinion contained in a blog post is. Posting images and videos is. Posting opinions is. Posting observations is. 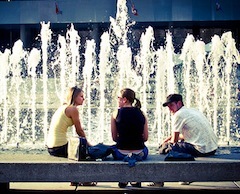 There are essentially three ways for people to interact with your content on Google Plus. They can +1 it, share it and make a comment on it. In my experience so far, people +1 something as a way of saying – I like that. They share as a way of saying I want people that I’m connected with to see that (it’s one way people fill up their own stream.) They make comments when they want to agree or disagree or in response to a question. Because of the way the entire content and conversation package is displayed on Google Plus the comments are a bigger part of how the conversation ends up then they might be on the more traditional blogging format. Noting some of the differences stated above has me playing around with getting the mix right, but I can say it’s a work in progress. Sometimes you make a simple observation and find the conversation wanders into considering your own mortality. Here are a handful of posts that show the different kinds of engagement for different kinds of content with the engagement numbers for each. Here’s a repost of a short YouTube video about giving referrals (another interesting thing about G+, videos, even ones you’ve previously posted elsewhere, do very well) – +31, 25 shares, 24 comments – short, inspiring videos can draw lots of attention. Here’s another one that’s just an image from a photo shoot for a magazine – okay, it’s a pretty cool photo, but look at the conversation – +56, 1 share, 48 comments – again, another case of an image drawing +1 and comments, but not as many shares. And lastly – Here’s where I created a graphic that stated something that the early users of Google Plus were all thinking, but I was one of the first to capture it I guess – The brutally honest guide to naming circles on Google+ +78, 2029 shares, 96 comments – one of the most shared images of all time mainly because it contained a powerful insight and the timing was right. Shares are probably the most important if you want to build your audience and get more traffic. Thoughtful insights, useful videos and valuable how to content is what people share. +1s may help some day in search and comments are an important sign of healthy followings, but shares are where it’s at. Google Plus is often in the top three spots, and more than once the top spot, in daily traffic to my site. And yet, traffic from other social networks has not dropped. So, making the effort to get your posting on Google Plus right – meaning tailoring it to the Google Plus conversation – is not only worth the effort in terms of traffic, it will certainly be worth it one day in terms of search and is already worth it today in terms of stimulating conversation.